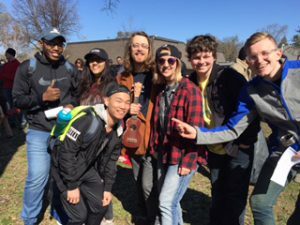 On a sunny but cool Monday morning in April, IPR’s Speech Communications class gathered at Powderhorn Park in South Minneapolis to participate in local indie musician Jeremy Messersmith’s kick off of his Obscenely Optimistic micro-tour, promoting his latest album of the same name. Observing artists in the wild is one way we at IPR treat the world as our classroom. As part of our study and practice of public speaking, we were curious to see what Messersmith was up to in his latest musical experiment, described as, “The Best Road Trip Ever! Micro Tour is a collection of 50 free micro-shows all over America: 15 minutes of unamplified music in a scenic and notable public place.” We were lucky enough to attend the inaugural show. Messersmith’s speaking and singing voice was amplified through an old-school megaphone and his performance was punctuated by the occasional planes flying overhead, dogs barking, and a toddler wielding a maraca. We at IPR may be a micro-community, but we are part of a much larger, very vibrant creative community in the Twin Cities. Our students engage with this larger community in myriad ways, learning from and contributing to innovative art being produced all around us. When we approached Messersmith after his short and sweet performance, we asked two questions of our own: was he familiar with IPR and would he be willing to pose for a picture with us. His face lit up and he answered with an optimistic “Yes!” to both. This post was written by Gail Milstein, IPR writing and communications instructor.